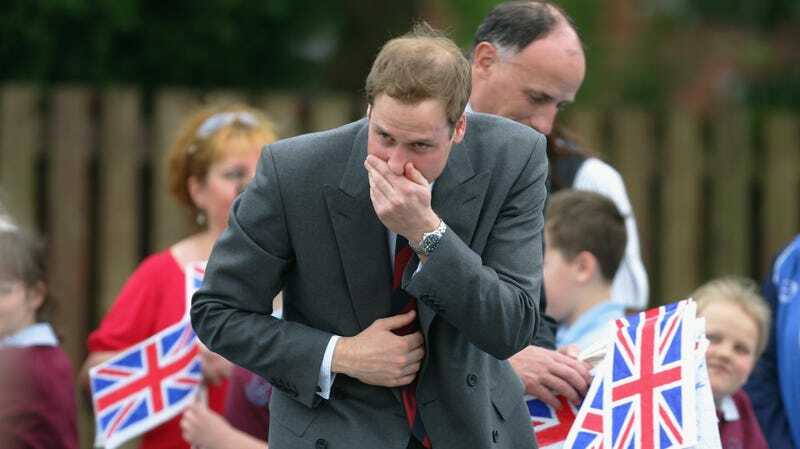 Prince William of the UK, displaying bad sneezing form. There’s a good chance you’ve had at least one disgusting cold this winter. And if you’re the least bit courteous, you probably took steps to keep from spreading your misery to others, whether by staying at home, washing your hands regularly, or minding where you coughed and sneezed. But if you’re the kind of person who regularly covers their respiratory expulsions with their hands... buddy, you’re doing it wrong. For years now, public health organizations have been telling us to dive into our arms and elbows if nothing else, like a tissue, is available, rather than letting it out into our hands. Kids have even been getting lessons on the subtle art of arm coughing from Sesame Street characters. Still, as with any piece of relatively new advice, it’s tough to say how many of us have really internalized it. Judging by my entirely unscientific, observational survey of my fellow commuters and coworkers this past week, though, it appears we need another reminder. The logic behind arm sneezing is simple. The infectious, airborne droplets that we spew out into our hands can be easily transmitted to others directly or through the surfaces we absentmindedly touch with our contaminated fingers. And the larger size of our elbows or sleeves should at the very least provide less of an opportunity for germs to flitter out into the air. There’s a whole field of research looking at the best ways to keep your coughed-out cold and flu germs away from everyone else (the umbrella term is fittingly known as cough etiquette). But there’s actually been surprisingly little research comparing the various methods of covering your coughs and sneezes. The most relevant one I could find was a 2013 study from researchers at the University of Alberta in Canada. It recruited a small group of healthy people to cough to their heart’s content under different conditions. They either wore a face mask, coughed into their arm, coughed into their hand, or coughed into a tissue. As the volunteers coughed, the researchers then used lasers to measure the level of airborne droplets that escaped from their mouths. The team came to a pretty depressing conclusion: Every single method, including the arm sneeze and face mask, still left plenty of tiny aerosolized particles that could, at least in theory, be capable of infecting someone through the air. The researchers also lightly criticized the rapid endorsement by doctors and public health organizations of arm covering as a useful measure for cold prevention. “Society has adopted this maneuver without asking for or demanding scientific evidence,” they wrote. Since that study, though, there doesn’t seem to have been similar research on the merits of arm sneezing, from that team or anyone else. But according to Jonathan Chiang, an engineer and one of the co-authors of the study, their results didn’t prove that everyone should stop covering their coughs or sneezes with their arms. But although sneezing or coughing into your arm isn’t a perfect strategy, it still beats your hands. There’s plenty of research showing that the things we touch—whether it’s subway poles, smartphones, or shared computer keyboards—can become ridden with the bugs and germs on our hands. Flu and cold viruses, meanwhile, can definitely survive for hours on these environmental surfaces. Still, however you decide to sneeze and cough, just be mindful of cleaning up afterwards. In other words, just because you’re sneezing into your arm, that doesn’t mean you’re still not capable of being a walking disease-monger. Try to stay home if you can.